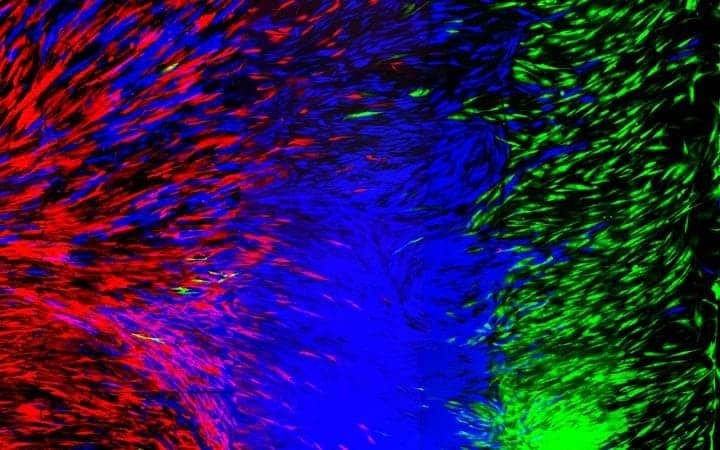 New research is merging 3D printing with human stem cells to provide on-demand tissues such as ligaments and tendons for transplant. Fluorescent cells the team printed to showcase their new process. Image credits Robby Bowles / University of Utah College of Engineering. It’s a tough life, and sometimes, our bodies pay the price. Such tolls, however, needn’t be permanent — and, new research from the University of Utah is making it easier than ever before to repair the damage. The team’s efforts pave the way to 3D-printed human tissues such as ligaments and tendons that can be used from transplant. “This is a technique in a very controlled manner to create a pattern and organizations of cells that you couldn’t create with previous technologies,” says University of Utah biomedical engineering assistant professor and paper co-author Robby Bowles. Patients that require replacement tissues currently also need to supply it themselves from another part of the body or receive it from a cadaver. Such procedures carry their own risks, involve quite a lot of discomfort on the part of the patient, and (especially in the case of cadaver-sourced tissues) may be very off-putting for certain people. There’s also the risk that replacement tissue is of poor quality, either due to wear and tear or complications in the material’s retrieval from the body. In an effort to work around these issues and reduce the total number of surgeries a potential patient would have to go through to receive a replacement, Bowles’ team worked on developing a 3D-printing method which can produce viable biological tissues. Development of the process took two years to complete, the team reports. It relies on stem cells harvested from a patient’s body fat, which are printed on a hydrogel layer to form a tendon or ligament. These cells are grown in vitro (in the lab) in a culture and then implanted. According to the team, the technique can be used to create replacements for connective tissue such as ligaments, tendons, or cartilage — even complex structures such as spinal disks. Such disks are very complex structures that include bony interfaces (transitional areas), and must be reconstructed completely for a successful transplant, they add. “[The 3D-printing process] will allow patients to receive replacement tissues without additional surgeries and without having to harvest tissue from other sites, which has its own source of problems,” says Bowles. Much of the research went exactly into tackling complex structures such as spinal disks. Connective tissue is never ‘pure’ — it always includes multiple and complex patterns of interweaving cells. The tendons that flank your muscles, for example, must have transition zones to gradually shift into and attach to adjacent tissues, be them bone or muscle. Bowles and his co-author David Ede, a former biomedical engineering master’s student at Utah, teamed up with Salt Lake City-based company, Carterra, Inc., which develops microfluidic devices for medicine. They developed their printer starting from a piece of hardware that Carterra typically uses to print antibodies for cancer screening applications. Bowles’ team developed a new printhead for the device that can lay down human cells with a high degree of control. The printhead, Bowles adds, could be adapted for any kind of 3-D printer. As a proof of concept, the duo printed genetically-modified, fluorescent cells, so they could analyze the structure of the final tissue. Bowles, with a background in musculoskeletal research, said the technology currently is designed for creating ligaments, tendons and spinal discs. However, he excitedly adds that “it literally could be used for any type of tissue engineering application”. Eventually, the team hopes their technique can be used to print out whole organs, which would be a major breakthrough for patients on transplant waiting lists the world over. The paper “Microfluidic Flow Cell Array for Controlled Cell Deposition in Engineered Musculoskeletal Tissues” has been published in the journal Tissue Engineering Part C: Methods.